People do many different things when under stress. Some people eat, some people go on a run; some people pull out all their hair, some people bite their fingernails, some people clean their houses like a crazy madwoman. Unfortunately, I like to cook. 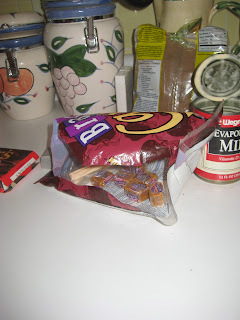 I scoured my pantry and discovered a bag of caramels, blocks of semi-sweet chocolate, some cake mixes and a lovely bag of what appeared to be chopped hazelnuts. Those I purchased myself last summer for a reason that currently escapes me. After googling that combination, I discovered what appeared to be a simple recipe. That was my first mistake. Then, spread the very thick batter in a brownie pan. It will be thick and might require a five- ton rolling pin to spread it around. If you’re lucky, you’ll realize about 3 minutes into baking it, that you are to spread HALF of the mixture in the pan and save the rest for the TOP. Oooops. When you finally MacGuyver a double boiler out of pans in your cupboard and begin the melting process, you’re a tad behind schedule. This requires a glas of wine, maybe TWO, and a deep breath. While the caramels are cooking, you are supposed to spread the semi-sweet chocolate chips on top of the first layer of cake/brownie mixture. 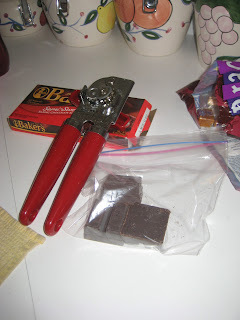 Now, because you only have blocks of semi-sweet chocolate, you’ll have to put them in a baggie and smash them with your heavy Kitchen Aid can opener. Handy Tip: Use the smooth end and not the one with the sharp opener contraption on it. Just trust me on that one. Oh, and cover the counter before you attempt to smash the hell out of the blocks of chocolate. Spread the incredibly ugly chunks along the first layer, and then drizzle the melted caramel on top. Be sure to hold the pan with your right hand/arm, and not the one that you injured when you tried to lift the five thousand pounds of salt out of your car this morning. That’s when you might discover that you probably tore something mighty important in your arm. After dropping the remainder of the cake mix on top of this brownie/caramel extravaganza, you can finally put it in the oven for 20 more minutes. Don’t bother cleaning up. Just take the bottle of wine into the living room and ignore the kitchen. Sure, the caramel brownies are amazingly sweet and decadent. But I don’t think I’ll be performing on the Food Network anytime soon. Unless they want me for cooking bloopers; then, I’m their girl. Girl, that is EXACTLY the kind of cooking show I would watch!!! You had me rolling. And, damn, I want to lick my screen after seeing the finished bars. They look awesome! I really laughed out loud when reading about your sister's pantry. That is EXACTLY what has been said about MY pantry! My family is constantly making fun of me. But, they have nothing to say when they need something, do they? My son's first girlfriend made a sign one day, after being amazed by the fact that everything she asked for magically appeared from within the pantry. It says "Mary Poppin's Pantry" and it still hangs on the door. I can't tell you how many holidays I received phone calls from my mother asking if I could bring such-and-such with me to her house, since you know, it's a holiday and the store's closed. Mmm hmmm...keep making fun of me! It looks pretty tasty from where I am sitting ... way the F*** down here at the bottom of the world. I don't care what it looks like; I would still eat it. I might just close my eyes first. 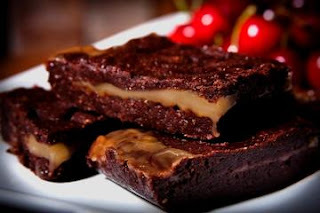 I have a copy of a similar recipe from a friend - the recipe also includes acne cream to put on the inevitable pimples one gets from these brownies. Enjoy! I cooked today but out of a box so you are way more talented than I am. THinking of you today and everyday, you had me fooled though I really thought you lived somewhere else. You almost had me looking at a map before I decided that your town in your blog was just to help protect you. I just got home from a LONG week-end working with the public. Speaking of wanting to pull your hair out. Now, since you shared your great pictures of what looks absolutely delicious, I have to go EAT!! 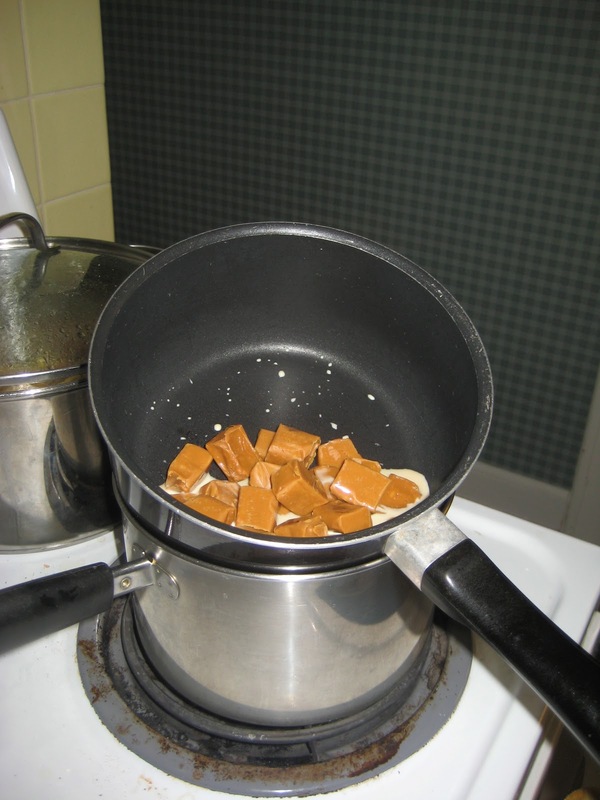 I have made those in the past, so as a matter of fact, "Yes, I do know how long it takes to unwrap all those caramels." And I know how hard it is not to eat every 4th one, too! Hahaha, thanks for the laugh. And I have done somewhat similar things when cooking. But those look really yummmmmy! You need your own show. Well, you're a damn sight funnier than the Barefoot Contessa. I'D give you your own show. Btw, you're just explained why I don't cook. Hahaha! Simple recipe, right? Let's just stick to bread, k? Loved it!!!! :) Have a better Monday! My sister can't cook but thinks she can. e.g. she stirs brown rice. She makes so many mistakes that one day I told her she needed to have her own cooking show called How Not To Cook. So darn glad I am not the only graduate of the oopsy dasiy school of cooking! Some people like to garden when they're upset but I don't like dirt. So I cook. Sometimes it works and sometimes there be pans a flyin'!! and I wonder WTF I was thinking. Well I would Certainly watch YOUR show! Yessireee! You had me belly laughing though your whole story, because I could SOOooo relate to it! I found your blog on Babble's top 50 mom blogs. That is quite a distinction, Congrats!I love your article. I hope you love my blog at www.thecribhub.com where we have a great crib sale. Please mail some to me right now. I'd cook them myself, but my oven is on the fritz and I somehow don't think these will work in the microwave... will they? Can totally relate. I tend to cook when I'm upset. And typically it's something the Iron Chef deems "slightly difficult." I wind up making really really expensive soup that's not really good. I will TOTALLY be tuning into the cooking bloopers show. Ina doesn't have any "easy" recipes but they really are delicious in the end:) Plus, we know we can trust her because she has clearly been tasting her own food (unlike some of the other INSANELY skinny cooks).